TomTom ONE is all-you-need car navigation in ONE smart product. Award winning software, the latest maps, user-friendly touchscreen and design make TomTom Europe's most popular in-car navigation solution. TomTom ONE 1st Edition has been discontinued. Accessories, spares and parts are still available for your ONE 1st Edition. TomTom ONE clear 3D navigation view allows you to see your current position better, much in the same way that you would see the real world, intuitively. It is particularly helpful when navigating junctions and roundabouts. Instantly working out the most efficient route to bring you right to the door of your destination. And getting you there with clear 3D maps and instructions in the language and voice that you've selected. TomTom ONE is the no-nonsense, user-friendly, portable car navigation system. It combines an easy-to-use touchscreen with a sleek design, to get you straight from A to B.
TomTom ONE is an elegant, wallet-sized device with built-in speaker and GPS antenna. It comes with the latest detailed map of your home country or region. TomTom ONE comes ready for TomTom PLUS, a range of services you can find at www.tomtom.com. which give you instant access to a vast array of constantly updated information. Everything from real time traffic or safety cameras reports to funnyand famous voices for your route instructions. Using Bluetooth connectivity, TomTom ONE allows you to ensure your journey will be both quicker and safer. Just ONE more reason for choosig TomTom ONE. Ready out of the box: Just plug in the TomTom ONE, switch on and go. Easy to take from car to car. TomTom ONE works with Tele Atlas Maps to provide detailed maps of the UK. Which in addition to street information include features such as route calculation, Points of Interest, Estimated Time of Arrival, and more. Further TomTom ONE maps are available SD card which insert directly into the TomTom ONE. Available maps include Western Europe, USA and Canada. Looking for genuine accessories and spares for the TomTom ONE 1st Edition? 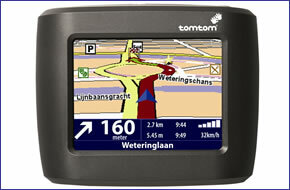 All parts are genuine TomTom product and specifically designed for use with the ONE 1st Edition sat nav. Accessories available to purchase include car charger and additional mount kit. Question: I have a TomTom ONE 1st edition which has not been updated for software or maps for several years. Can I still update the software without freezing the device and then purchase up to date maps? Answer: You will need to contact TomTom via http://www.tomtom.com or by phoning 0207 9490 134 and ask them if they do software and map updates for the TomTom one 1st Edition. We used to sell the maps on SD card, however TomTom stopped producing these several years ago in favour of a map download. Do you have a question about the TomTom ONE? Submit your question via our contact page.